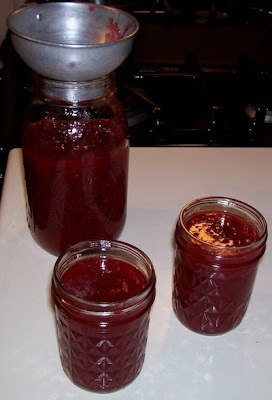 Susan's Cooking School: Plum Sauce -Fresh, Delicious and Easy! Fresh plums are now in the farmers' markets and grocery stores in our neck of the woods. 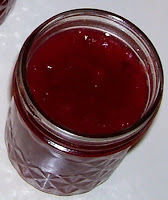 I used fresh Italian plums and black plums for the sauce pictured here. This versatile sauce is great for topping grilled chicken or pork. Try it, and I'm sure that you will come up with many more uses for it. Of course, it tastes good right out of the jar! Wash, halve and pit plums and place in a large pot with the sugar. Cook over low heat until the sugar melts, stirring often. The plums will release their juices and soften. Once the mixture comes to a simmer, continue to cook over medium heat until the plums are soft and mashable. Turn off the heat and add the lemon juice and sherry. I like to use a stick blender at this point to break down the skins and reduce the lumpiness, while leaving some chunks of plum in the sauce. If you don't have a stick blender, chop the plums before cooking, and they should break down sufficiently during cooking. It's really the skins that need to be chopped up -the plums turn themselves into sauce. I pour my sauce into canning jars and refrigerate. Please note: This recipe is not a canning recipe. I wish I had found you earlier, Susan. Although I know a lot about cooking and baking, I need help in the canning dept. Would love to make this sauce. I'm in Utica as well, near MVCC, AND have a blog. Hope you'll stop by my blog and check it out. Every Sunday I make a recipe from the Utica cook book.